I am trying to pretend that it is spring. We have been inundated with snow and my backyard is still coated in white stuff. This morning it was -11. 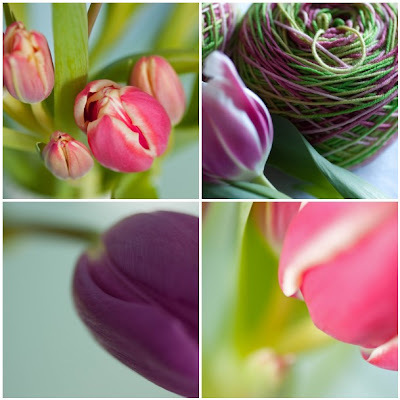 I am in firm denial and have created my own spring with a most cheerful bunch of $3.99 tulips from Safeway. 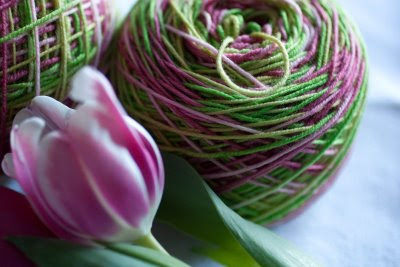 I was digging through my stash looking for color inspiration when I also found a beautiful sock yarn that matched my tulips. So out of my denial came these juicy photos that make me very happy. The other reason for these colorful photos is that my leg that has been injured from running is now healed and I have worked up my distance to a serious level again and am still planning to run a half marathon at the end of May. I have been a work-out machine running four days a week, swimming laps three days a week and faithfully doing strength training - all this cross-training to minimize further injury. It is a lot of working out hence knitting has been relegated to second place for now because between work and training there is not much time left. All these colors are inspiring me to keep active and sun and warm temps are promised this weekend - how good is that! !